Ag-experienced or memory T cells have increased reactivity to recall Ag, and can be distinguished from naive T cells by altered expression of surface markers such as CD44. Memory T cells have a high turnover rate, and CD8+ memory T cells proliferate upon viral infection, in the presence of IFN-αβ and/or IL-15. In this study, we extend these findings by showing that activated NKT cells and superantigen-activated T cells induce extensive bystander proliferation of both CD8+ and CD4+ memory T cells. Moreover, proliferation of memory T cells can be induced by an IFN-αβ-independent, but IFN-γ- or IL-12-dependent pathway. In these conditions of bystander activation, proliferating memory (CD44high) T cells do not derive from activation of naive (CD44low) T cells, but rather from bona fide memory CD44high T cells. Together, these data demonstrate that distinct pathways can induce bystander proliferation of memory T cells. Immunological memory ensures rapid and strong immune responses to recall Ags. T cell memory is due both to an increased frequency of and qualitative changes in Ag-specific T cells (1, 2, 3). In mouse, memory T cells express high levels of the adhesion molecule CD44 (4, 5). Recent encounter with Ag converts naive CD44low CD62L+ CD69− T cells to activated CD44high CD62L− CD69+ T cells, and a significant proportion of long-term CD44high memory T cells reverts to a CD62L+ CD69− phenotype (1, 6, 7). Ag-specific CD44high T cells can persist for months or years, but the mechanisms responsible for the maintenance of memory remain controversial. It is debated whether the presence of Ag is required for the survival of memory T cells (3, 8), or, on the contrary, whether the correct MHC molecule is required at all (9, 10). With respect to this latter question, two recent reports show that both CD4+ and CD8+ memory T cells can survive and proliferate in the absence of MHC class II or class I, respectively (11, 12). Sprent and colleagues have proposed a mechanism for the Ag-independent proliferation of memory T cells (13, 14). They have shown that a massive proliferation of CD44high CD8+ T cells occurring during viral infections can be induced by the injection of the synthetic dsRNA poly(I:C) via an IFN-αβ-dependent pathway, and by IL-15, which is induced by IFN-αβ. In contrast, the IFN-αβ/IL-15 pathway induces only marginal proliferation of CD4+ memory T cells, even though steady state proliferation of CD4+ memory T cells is high and comparable with that of CD8+ memory T cells (14, 15). It is therefore possible that additional activation pathways (involving other cytokines) can induce proliferation of memory T cells. It has been shown recently that activation of NKT cells, a subset of CD1d-restricted T cells expressing a biased TCR repertoire and markers common to the NK cell lineage (16, 17), induces IFN-γ production (18), as well as extensive proliferation and cytotoxicity (19) of NK cells. Upon activation, NKT cells secrete rapidly (within 1 h) large amounts of cytokines, including IFN-γ and IL-4 (20, 21, 22, 23), and production of IFN-γ by NKT cells induces IL-12 production by APC, establishing a positive feedback loop for IFN-γ production (24, 25). IFN-γ and IL-12, in turn, induce proliferation and cytotoxicity of NK cells (19). In addition to effects on NK cells, activated NKT cells induce proliferation of a minor population of T cells in spleen and liver (19). However, the phenotype of these proliferating bystander T cells has not been determined. We show in this study that NKT cells, activated by a CD1d-restricted and specific ligand, α-galactosylceramide (α-GalCer),2 induce extensive proliferation of memory (CD44high), but not naive (CD44low) T cells in spleen and liver. Interestingly, both CD4+ and CD8+ memory T cells proliferate in response to NKT cell activation, in an IFN-αβ-independent but IFN-γ- and IL-12-dependent pathway. However, NKT cells are not necessary for proliferation of memory T cells, because the bacterial superantigen staphylococcal enterotoxin A (SEA) also induces rapid and extensive bystander proliferation of SEA-nonreactive memory T cells. Therefore, cytokine production by activated T cells and NKT cells represents novel pathways to induce proliferation and maintenance of memory T cells. 5-Bromo-2′-deoxyuridine (BrdU) and poly(I:C) were purchased from Sigma (Buchs, Switzerland). SEA and staphylococcal enterotoxin B (SEB) were purchased from Toxin Technology (Saratoga, Florida). α-GalCer synthesized as described previously (26) was a kind gift of Dr. Y. Koezuka (Kirin Brewery, Gunma, Japan). C57BL/6 and DBA/2 females were purchased from Harlan/Netherlands (Zeist, The Netherlands). C57BL/6 Ly-5.1 congenic mice were purchased from The Jackson Laboratory (Bar Harbor, ME). CD1−/− (BALB/c × 129Sv)F2 mice and Jα281−/− 129 mice were provided by Dr. M. J. Grusby (Harvard School of Public Health, Boston, MA) and Dr. M. Taniguchi (Chiba University Graduate School of Medicine, Chiba, Japan), respectively, and backcrossed to C57BL/6 mice for three generations. IL-12 p40-deficient mice were provided by Hoffman-La Roche (Nutley, NJ). All mice were used at 8–12 wk of age. For α-GalCer treatment, mice were injected once i.v. with 2 μg of a stock solution of α-GalCer dissolved in 0.5% polysorbate 20 and 0.9% NaCl, which was subsequently diluted in 250 μl of PBS. As a control, mice were injected with an equivalent volume of vehicle, that is 0.5% polysorbate 20 and 0.9% NaCl diluted in PBS, or PBS alone. For poly(I:C), SEA, and SEB treatments, mice were injected once i.v. with 100, 5, or 10 μg of the compounds, respectively. To block the activity of IFN-αβ, mice were injected once the same day as α-GalCer with 200 μl of a sheep antiserum to IFN-αβ, or with 200 μl of normal sheep serum as a control (27). To block the activity of IFN-γ, mice were injected twice i.p. the same day as and the day after α-GalCer with 500 μg of the anti-IFN-γ mAb XMG1.2. For BrdU treatment, mice were fed for 3 days starting 1 day before PBS, vehicle, α-GalCer, poly(I:C), or superantigen treatment, with drinking water containing 1 mg/ml BrdU and 5% d-glucose. An Ag-specific CD8+ T cell response was generated by injecting DBA/2 mice i.p. with 107 P815 cells expressing the human HLA-CW3 molecule (28, 29). One year later, immune mice were treated as described above. Single cell suspensions were prepared from liver and spleen. Total liver cells were resuspended in a 40% isotonic Percoll solution (Pharmacia, Uppsala, Sweden) and underlaid with an 80% isotonic Percoll solution. Centrifugation for 20 min at 1000 × g isolated the mononuclear cells at the 40–80% interface. Cells were washed twice with PBS containing 2% FCS. Spleen cells were resuspended in DMEM supplemented with 5% FCS and 1% HEPES and loaded onto 10-ml nylon wool columns that had been preincubated overnight at 37°C with supplemented medium. The columns were incubated 45 min at 37°C, and cells enriched in T, NK, and NKT cells were harvested by washing the columns with 20 ml of supplemented medium. The following mAbs were purchased from PharMingen (San Diego, CA): PE-conjugated anti-NK1.1 (PK136), anti-CD44 (Pgp-1) and anti-CD69 (H1.2F3), Cy-chrome-conjugated anti-CD4 (RM4-5) and anti-CD8α (53-6.7), and APC-conjugated anti-CD4 (RM4-5) and anti-CD44 (Pgp-1). FITC-conjugated anti-BrdU mAb was purchased from Becton Dickinson (San Jose, CA). FITC-conjugated anti-CD44 (Pgp-1), anti-CD62L (Mel-14), and anti-Vβ10 (B21.5) were prepared at the Ludwig Institute (Epalinges, Switzerland). Cells were preincubated with 2.4G2 culture supernatant to block Fcγ receptors, then washed and incubated with the indicated mAb conjugates for 40 min in a total volume of 100 μl of PBS containing 2% FCS. Cells were washed and analyzed on a four-color FACScalibur flow cytometer (Becton Dickinson). Mice were fed with BrdU, and the cells isolated from the different organs were first preincubated with 2.4G2 culture supernatant, washed, and stained for CD44, NK1.1, and CD4 or CD8. Cells were then purified (∼95% purity) by electronic sorting on a FACStarPlus (Becton Dickinson, San Jose, CA), and a maximum of 5 × 105 sorted cells was fixed in 200 μl of 70% ethanol overnight at 4°C. Cells were then successively washed and incubated at room temperature in 3 N HCl for 20 min, 0.1 M Na2B4O7 for 3 min, and 15 μl of anti-BrdU mAb for 1 h. Cells were washed and incubated in 200 μl of PBS containing 2% FCS and 12.5 μg/ml of PI, together with 50 μg/ml of RNase A in 100 μl STE buffer (100 mM Tris base, 100 mM NaCl, and 5 mM EDTA at pH 7.5) for 5 min at 37°C. Cells were resuspended in PBS containing 2% FCS and analyzed on a three-color FACScan flow cytometer (Becton Dickinson). The CD44high and CD44low subsets of NK1.1− CD4+ or NK1.1− CD8+ T cells were purified by electronic sorting from spleen of C57BL/6 Ly-5.2+ mice, resuspended in 250 μl of PBS, and injected i.v. in C57BL/6 Ly-5.1+ mice fed with BrdU-containing water. One day later, mice were injected with PBS, α-GalCer, or SEB. Three days after cell transfer, cells isolated from liver and spleen were stained for Ly-5.2, CD44, and CD4 or CD8, purified by electronic sorting, and stained for BrdU. We have recently reported that, in addition to NK cells, a significant proportion of T cells in liver and (to a lesser extent) spleen rapidly undergoes proliferation when NKT cells are specifically activated by the synthetic ligand α-GalCer (19). As shown in Fig. 1⇓, this bystander T cell proliferation is strictly dependent upon NKT cell activation, because it is reduced to background levels in the liver and spleen of mice deficient for either CD1d or Jα281 (a TCR Jα segment used by most CD1d-restricted NKT cells). In agreement with our previous study (19), bystander NK cell proliferation is also totally NKT cell dependent following α-GalCer injection (Fig. 1⇓). Bystander T cell proliferation induced by α-GalCer is NKT cell dependent. BrdU-treated C57BL/6 (wt), CD1d-deficient (CD1d°), or Jα281-deficient (Jα281°) mice were injected with 2 μg α-GalCer. After 3 days, liver or spleen cells were isolated and stained with mAbs to CD3 and NK1.1 (19 ). T cells (CD3+ NK1.1−) and NK cells (CD3− NK1.1+) were electronically sorted and stained for BrdU content. Numbers indicate the percentage of BrdU+ cells. In control BrdU-treated mice injected with PBS or vehicle, the percentage of BrdU+ cells was 5–10% in liver and 3–5% in spleen (data not shown). 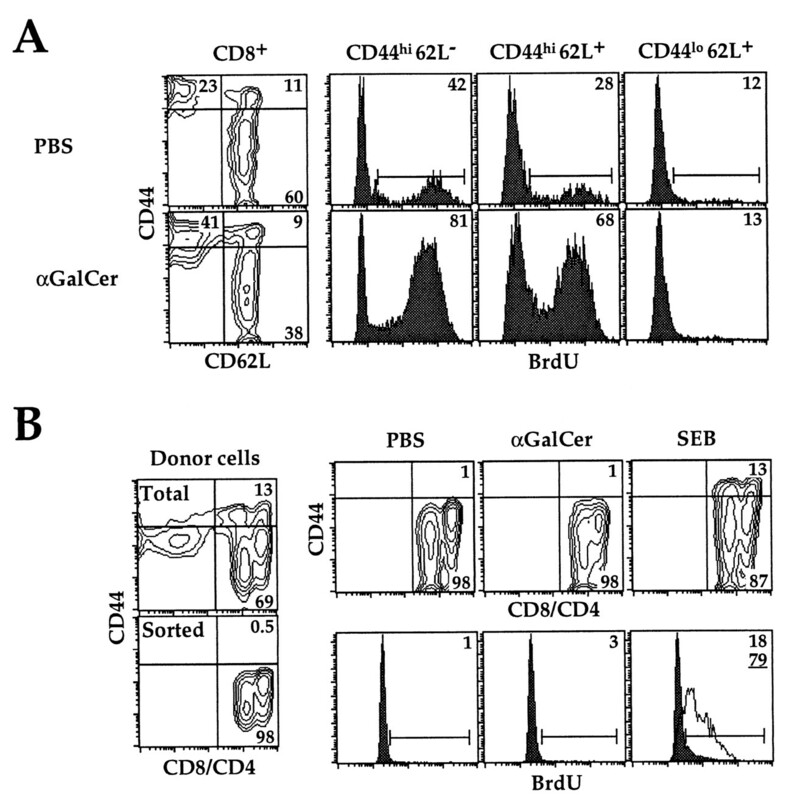 Based on earlier data showing that bystander or Ag-independent proliferation of CD8+ T cells mainly occurred in the CD44high compartment (13, 14), we purified CD44high and CD44low T cells from the liver and spleen of mice treated 2 days earlier with PBS or α-GalCer. Fig. 2⇓ shows that the proportion of CD44high T cells is higher in liver than in spleen, both in the case of CD4+ or CD8+ T cells. Upon α-GalCer treatment, the proportion of CD44high T cells is not significantly altered (data not shown). Similar to bystander activation of CD8+ T cells by poly(I:C) or IL-15 (13, 14), only CD44high liver and spleen T cells undergo proliferation upon NKT cell activation, as measured by the incorporation of the thymidine analogue BrdU (Fig. 2⇓). Surprisingly, however, both CD4+ and CD8+ CD44high T cell proliferation is induced by activated NKT cells. As a positive control, Fig. 2⇓ shows the proliferation of T cells in response to the IFN-αβ inducer poly(I:C). In contrast to earlier findings in lymph nodes (13, 14), poly(I:C) induces proliferation of both CD4+ and CD8+ CD44high T cells in liver and, to a lesser extent, in spleen. A second positive control shows the proliferation of NK cells induced by activated NKT cells, as reported earlier (19). Bystander proliferation of CD4+ and CD8+ memory T cells. BrdU-treated C57BL/6 mice were injected with PBS (or vehicle), 2 μg of α-GalCer, 100 μg of poly(I:C), or 5 μg of SEA, and liver (A) and spleen (B) cells were isolated after 2 days. The CD44high and CD44low subsets of CD4+ NK1.1− and CD8+ NK1.1− T cells (defined by rectangles in the cytograms) were purified by electronic sorting and stained for BrdU content. 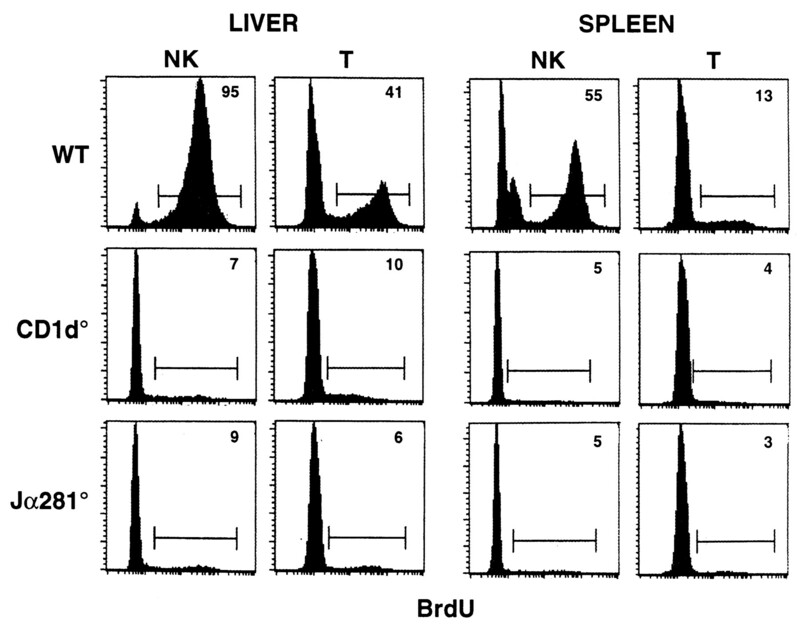 The first row of histograms shows staining of cells purified from mice not treated with BrdU, and the first column of histograms shows positive control stainings of purified NK (CD3− NK1.1+) cells. Negative controls performed with PBS or vehicle gave identical results (second row). Staining of cells with PI (together with anti-BrdU) to quantitate DNA confirmed results obtained with BrdU stainings. Numbers indicate the percentage of CD44high or CD44low cells among CD4+ or CD8+ T cells (cytograms), and the percentage of BrdU+ cells (defined by bars in the histograms) among the indicated cell populations. The experiments shown are representative of five independent experiments for α-GalCer treatment, and two independent experiments for poly(I:C) and SEA treatments. Poly(I:C) induces proliferation of CD8+ memory T cells via an IFN-αβ-, and presumably IL-15-dependent pathway (13, 14) (Fig. 3⇓A). In contrast, activated NKT cells induce proliferation of CD4+ and CD8+ memory T cells in an IFN-αβ-independent pathway, because the proliferation is not inhibited in mice treated with anti-IFN-αβ antiserum (Fig. 3⇓A). Instead, we have shown recently that the induction of NK cell proliferation by activated NKT cells requires IL-12 or IFN-γ, because this effect was significantly reduced in IL-12-deficient mice treated with anti-IFN-γ mAb, but not in IL-12- or IFN-γ-deficient mice alone (19). The involvement of an IL-12- and IFN-γ-dependent pathway also holds true for the induction of memory T cell proliferation, as shown by the significant reduction in proliferation found in IL-12-deficient mice treated with anti-IFN-γ mAb as compared with the minor reduction observed in IL-12-deficient mice alone (Fig. 3⇓B). Hence, different cytokine pathways, involving either IFN-αβ or IFN-γ and IL-12, can induce proliferation of memory T cells. IL-12- or IFN-γ-dependent proliferation of memory T cells. BrdU-treated C57BL/6 wild-type (wt) or IL-12-deficient (IL-12o) mice were injected i.p. with PBS, anti-IFN-αβ, or anti-IFN-γ, and i.v. with PBS, 2 μg of α-GalCer, 100 μg of poly(I:C), or 5 μg of SEA, as indicated. Liver cells were isolated after 2 days, and the CD44high and CD44low subsets of CD4+ NK1.1− and CD8+ NK1.1− T cells were purified and stained for BrdU content. Numbers indicate the percentage of BrdU+ cells among CD44high T cells. The percentage of BrdU+ cells among CD44low T cells did not exceed 5%, as shown in Fig. 2⇑. The experiment shown in A is representative of two independent experiments, whereas the numbers in B are the mean ± SD of three independent experiments. The bacterial superantigen SEB has been shown to induce rapid (within 1 h) production of IL-2, IFN-γ, TNF-α, and TNF-β in vivo (30, 31). Because this scenario presents some similarities with the events following NKT cell activation, we tested whether superantigen-activated T cells could also induce bystander proliferation of memory T cells. SEA was used in place of SEB, because SEB reacts with Vβ8.2 chains used by a majority of CD1d-restricted NKT cells, whereas SEA reacts with Vβ3, Vβ11, and Vβ12 chains (32) not used by CD1d-restricted NKT cells. In this way, we avoided the possibility that superantigen could induce bystander proliferation via NKT cells. Fig. 2⇑ shows that SEA induces extensive bystander proliferation of both CD4+ and CD8+ (Vβ3−, Vβ11−, or Vβ12−) CD44high memory T cells. Moreover, a significant proportion of (Vβ3−, Vβ11−, or Vβ12−) CD44low T cells also proliferates in response to SEA, possibly reflecting a more potent induction of bystander T cell proliferation by SEA. Nevertheless, whereas the absolute numbers of SEA-reactive T cells increased ∼3-fold, the absolute numbers of non-SEA-reactive T cells increased only ∼1.3-fold (data not shown). Interestingly, SEA also induces extensive NK cell proliferation, similar to poly(I:C) and α-GalCer. In summary, bystander proliferation of memory T cells can be induced by mechanisms involving the activation of different cell types by viruses, superantigens, or synthetic glycolipids such as α-GalCer. CD1d-restricted NKT cells express low levels of CD62L and high levels of CD69 (33), a phenotype found on recently activated T cells. Moreover, activated NKT cells rapidly secrete large amounts of cytokines, including IFN-γ (21, 22, 23). Therefore, it is possible that NKT cells are required for the proliferation and maintenance of the pool of CD44high memory T cells via chronic production of cytokines. Fig. 4⇓ shows that this is clearly not the case. In the absence of CD1d-restricted NKT cells in CD1d- or Jα281-deficient mice, the proportion and steady state proliferation of memory T cells are not decreased as compared with T cells in wild-type animals. Moreover, SEA-induced proliferation of memory T cells is normal in NKT cell-deficient mice (data not shown). Activated NKT cells therefore represent one of several pathways that lead to the proliferation of memory T cells. NKT cells are not necessary for the proliferation of memory T cells. 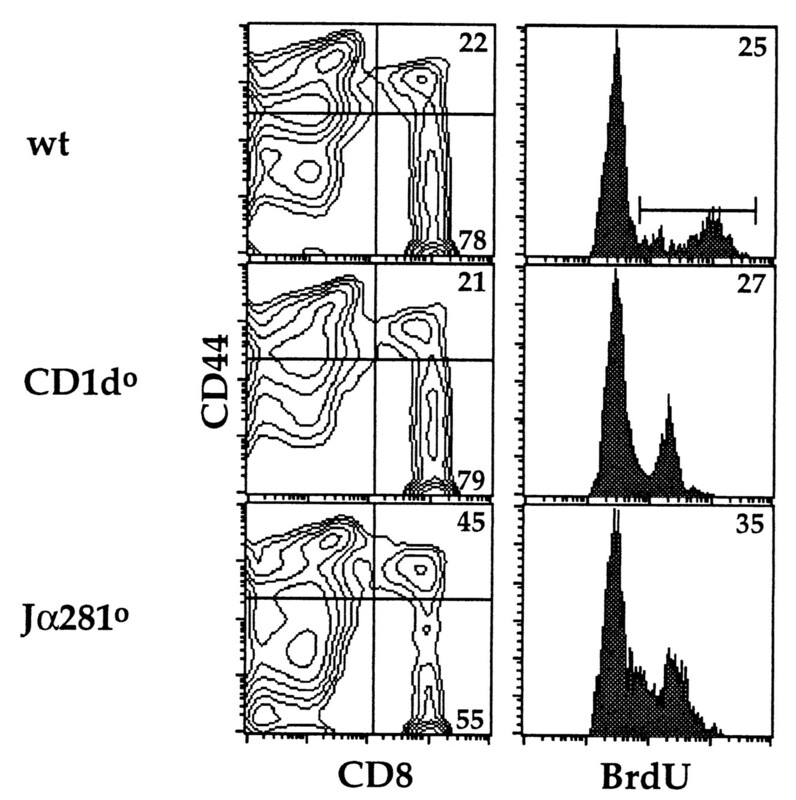 Liver cells were isolated from BrdU-treated C57BL/6 wild-type (wt), CD1d-deficient (CD1d°), or Jα281-deficient (Jα281°) mice, and the CD44high and CD44low subsets of CD8+ NK1.1− T cells were purified and stained for BrdU content. Numbers indicate the percentage of CD44high or CD44low cells among CD8+ T cells, and the percentage of BrdU+ cells among CD44high CD8+ T cells. Similar results were obtained in CD4+ T cells. The experiment shown is representative of three independent experiments. It remains to be demonstrated formally that proliferating CD44high T cells derive from CD44high T cells, and not from naive CD44low T cells that up-regulate surface CD44 expression upon bystander activation. This problem is evoked in Fig. 5⇓A. CD8+ T cells were stained for CD62L, a selectin rapidly down-modulated upon TCR-mediated activation (34) and reexpressed in a subset of memory cells (6, 7), and CD44, stably expressed at high levels on memory cells (4, 5). Upon NKT cell activation, both CD62L− and CD62L+ CD44high T cells proliferate, suggesting, as shown in earlier reports, that bystander proliferation does not require TCR-mediated activation (13, 14). Similar results are obtained when CD8+ T cells are stained for the early activation marker CD69 and CD44 (data not shown). Hence, bystander proliferation strictly correlates with the CD44high memory phenotype. Nevertheless, it cannot be formally excluded that, in the particular circumstances of bystander activation, naive CD62L+ CD44low T cells proliferate and differentiate into memory-phenotype CD62L− CD44high or CD62L+ CD44high T cells in an Ag-independent manner. To exclude that CD44low T cells could proliferate and differentiate into CD44high T cells upon bystander activation, purified Ly-5.2+ CD44low T cells were adoptively transferred into Ly-5.1+ congenic mice, which were subsequently injected with α-GalCer. As shown in Fig. 5⇓B, donor-derived CD44low T cells neither increase CD44 expression nor proliferate upon activation of NKT cells, whereas donor- or host-derived CD44high T cells are induced to proliferate (data not shown). As a control, donor-derived CD44low T cells remain functional after adoptive transfer, because SEB-reactive (Vβ7+ or Vβ8+) T cells (32) can be induced to up-regulate CD44 expression and proliferate when directly activated by the superantigen (Fig. 5⇓B). CD44low T cells do not differentiate into CD44high T cells upon bystander activation. A, BrdU-treated C57BL/6 mice were injected with PBS or 2 μg of α-GalCer. Liver cells were isolated after 2 days, and the CD44high CD62L−, CD44high CD62L+, and CD44low CD62L+ subsets of CD8+ T cells were purified and stained for BrdU content. Numbers indicate the percentage of cells of each subset among CD8+ T cells (cytograms), and the percentage of BrdU+ cells among the indicated cell populations (histograms). The experiment shown is representative of two independent experiments. B, CD44low CD4+ and CD8+ donor T cells were purified from B cell-depleted Ly-5.2+ C57BL/6 spleen cells. BrdU-treated Ly-5.1+ C57BL/6 host mice were adoptively transferred with 7 × 106 donor CD44low T cells, and injected 1 day later with PBS, 2 μg of α-GalCer, or 10 μg of SEB. Spleen cells were isolated after 2 days; stained for Ly-5.2, CD44, CD4, and CD8; purified; and stained for BrdU content. Numbers indicate the percentage of cells of each subset among total donor (Ly-5.2+) T cells before transfer (left cytograms) or after transfer (upper right cytograms), and the percentage of BrdU+ cells among the donor-derived cells (histograms). 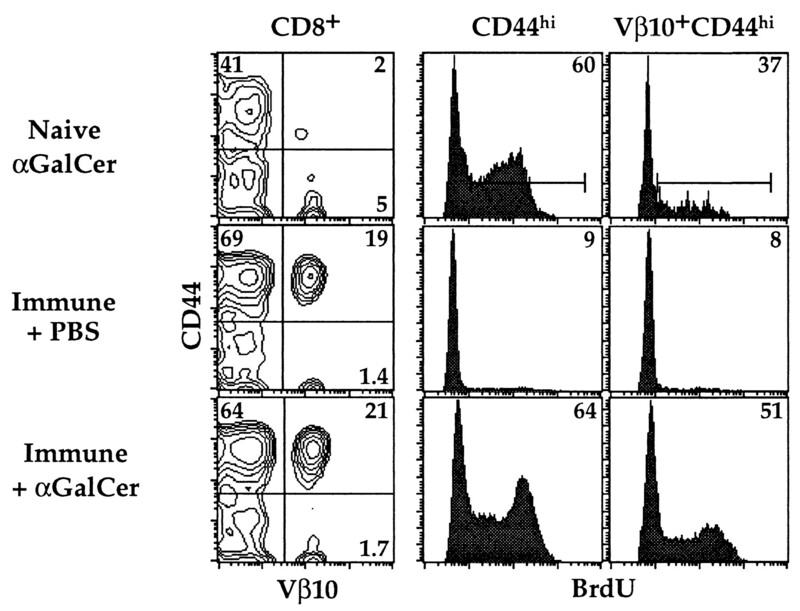 In the lower right histogram, the plain and the underlined numbers indicate the percentage of BrdU+ cells among CD44low and CD44high donor-derived cells, respectively. Among host (Ly-5.1+)-derived CD44high T cells, 60–70% cells stained positive for BrdU in α-GalCer-treated mice. Similar results were obtained in cells isolated from host liver. The experiment shown is representative of two independent experiments. In another set of experiments, transfer of CD44high T cells resulted in a very low recovery of donor-derived cells, presumably due to the fact that the anti-CD44 mAb (Pgp-1) used to purify memory cells is of rat IgG2b isotype, which leads to depletion of targeted cells in mice. Nevertheless, 40–50% of surviving donor-derived CD44high T cells were BrdU+ upon α-GalCer treatment of host mice. Finally, we then tested whether bona fide Ag-specific memory T cells proliferate upon bystander activation, in a system in which Ag-experienced T cells can easily be followed by flow cytometry. Indeed, DBA/2 mice injected with syngeneic P815 tumor cells expressing the human HLA-CW3 molecule reject the tumor within 2 wk and show a massive expansion of HLA-CW3-specific, CD44high Vβ10+ CD8+ T cells that persists for at least 1 yr (28, 29) (Fig. 6⇓). In DBA/2 mice that have rejected P815-CW3 tumor cells 1 yr earlier, α-GalCer treatment (hence NKT cell activation) indeed induces proliferation of Ag-specific memory CD44high Vβ10+ CD8+ T cells to a similar extent as total CD44high T cells (Fig. 6⇓). Altogether, these data strongly suggest that proliferating bystander memory-phenotype T cells derive from bona fide memory T cells rather than from activated naive T cells. Ag-specific CD44high T cells proliferate upon bystander activation. BrdU-treated naive or immune (P815-CW3-injected) DBA/2 mice were injected with PBS or 2 μg of α-GalCer, as indicated. Liver cells were isolated after 2 days, and the total CD44high or Vβ10+ CD44high subsets of CD8+ T cells were purified and stained for BrdU content. Numbers indicate the percentage of cells of each subset among CD8+ T cells (cytograms), and the percentage of BrdU+ cells (histograms). The experiment shown is representative of two independent experiments. Although it is a long-debated question whether T cell memory requires the continuous presence of Ag (1, 3, 8), recent data from Murali-Krishna et al. (11) and Swain et al. (12) suggest that CD4+ and CD8+ memory T cells survive and even proliferate in the absence of MHC class II and class I molecules, respectively. Ag-independent proliferation of T cells is known as bystander activation, best documented during lymphocytic choriomeningitis virus infection among the massively expanding population of CD8+ T cells (35, 36, 37). Even though recent data show that the frequency of bystander activation is very low (ranging from 10% to <1%) (38, 39, 40, 41), Tough et al. (13) report that mice injected with the synthetic dsRNA poly(I:C) (an inducer of IFN-αβ that mimics some aspects of viral infections) show extensive bystander proliferation of CD8+ T cells of the CD44high memory compartment. This effect is dependent on IFN-αβ, and can be mimicked by the injection of IL-15 (which is inducible by poly(I:C) and IFN-αβ), presumably because CD44high CD8+ T cells express high levels of CD122 (the common β-chain of the IL-15R and IL-2R) (14). It has not been reported to date whether bystander proliferation also occurs in CD4+ T cells, even though the steady state turnover of CD44high CD4+ T cells is high and similar to that of CD44high CD8+ T cells (∼50% BrdU+ cells in vivo after 2 wk of exposure to BrdU). Moreover, it is unknown whether other pathways, distinct from the IFN-αβ/IL-15 pathway, also induce bystander proliferation of memory T cells. We show in this study that specific activation of CD1d-restricted NKT cells by the synthetic ligand α-GalCer induces extensive proliferation of liver and spleen CD4+ and CD8+ CD44high T cells. Surprisingly, i.v. injection of poly(I:C) also induces extensive proliferation of both liver CD4+ and CD8+ memory T cells. This discrepancy with earlier results obtained by Zhang et al. (14), showing that i.p. injection of poly(I:C) induces proliferation of CD8+ but not CD4+ CD44high T cells in lymph nodes, may be explained by the use of different routes of poly(I:C) injection (which may result in the production of different levels of cytokines) and/or monitoring of different organs. 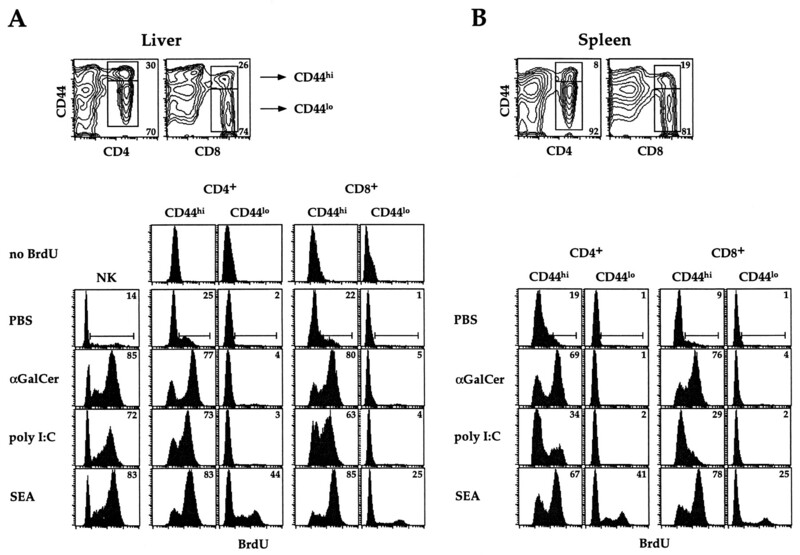 It is possible that CD44high T cells in liver, which contains a higher proportion of CD44high T cells as compared with spleen (Fig. 2⇑) and lymph nodes (14), are more sensitive to bystander activation. Nevertheless, Zhang et al. (14) have shown, both in vitro and in vivo, that IL-15 induces proliferation of CD8+ but not CD4+ CD44high T cells, suggesting together with our results that pathways distinct from the IFN-αβ/IL-15 pathway may induce proliferation of memory CD4+ T cells. Indeed, we find that upon NKT cell activation, bystander proliferation of CD4+ and CD8+ memory T cells requires IFN-γ or IL-12 rather than IFN-αβ. Even though IFN-γ, together with LPS, induces IL-15 production by monocytes (42), IFN-γ is less potent than IFN-α, IFN-β, or LPS alone in inducing IL-15 mRNA synthesis in macrophages, whereas IL-12 does not induce IL-15 mRNA synthesis at all (14). Hence, in addition to IFN-αβ and IL-15, other cytokines, including IFN-γ and IL-12, are involved in the induction of bystander proliferation of memory T cells by activated NKT cells and poly(I:C). A wide array of pathogens induces the production of cytokines found to date to be involved in the induction of bystander activation of memory T cells, namely IFN-αβ, IL-15, IFN-γ, and IL-12. Indeed, virus-infected cells generally produce IFN-αβ (43). Moreover, IL-15 mRNA is reported to be up-regulated in monocytes infected with herpesviruses and bacteria (42). Production of IL-12 is induced in dendritic cells, macrophages, and monocytes by IFN-γ, and most types of pathogens (including viruses, bacteria, fungi, and parasites) induce IL-12 production in phagocytic cells, including macrophages and neutrophils (44). Finally, IFN-γ is produced by activated CD4+ and CD8+ T cells, and is induced in NK cells by IL-12 and IL-15 among other cytokines (45). Therefore, it is probable that many types of infections and many types of cells induce bystander proliferation of memory T cells and contribute to the maintenance of T cell memory. We show in this study that α-GalCer-activated NKT cells and superantigen-activated conventional T cells induce bystander proliferation of memory T cells (Fig. 2⇑). The absence of any particular population of cells, such as CD1d-restricted NKT cells in CD1d- or Jα281-deficient mice, does therefore not affect steady state or bystander-induced proliferation of memory T cells (Fig. 4⇑). The hyaluronan-binding molecule CD44 is expressed at low to intermediate levels on naive T cells. Upon activation of T cells, high levels of CD44 are expressed for a prolonged period of time, thereby defining a phenotype for memory T cells (4, 5). L-selectin or CD62L is expressed on resting T cells, and is cleaved by a surface metalloprotease upon TCR activation (34). After removal of Ag, a subset of Ag-experienced (or memory) T cells reexpresses CD62L (6, 7). We find that NKT cells induce proliferation in both CD44high CD62L− and CD44high CD62L+ T cells (Fig. 5⇑A). Similarly, Tough et al. (13) reported that proliferation of CD44high CD8+ T cells induced by poly(I:C) injection was not associated with expression of the early activation markers CD69 or CD25, suggesting that bystander activation of CD44high T cells occurs via a sequence of events distinct from those induced by Ag via the TCR. However, it is not formally excluded that CD44 up-regulation, and in some cases CD62L shedding, can be induced in an Ag- and TCR-independent manner during bystander activation. Interestingly, Unutmaz et al. (46, 47) reported that human naive CD45RA+RO− cells proliferate in vitro without Ag in the presence of a combination of IL-2, IL-6, and TNF-α. Moreover, the cultured naive cells differentiated from a naive CD62L+ CD69− phenotype to an activated CD62L− CD69+ phenotype, even though they remained CD45RA+RO−, showing that cytokine-activated naive T cells can modulate expression of activation markers in an Ag-independent manner in vitro. However, we show in this study that adoptively transferred CD44low T cells are not induced to proliferate and do not up-regulate CD44 upon NKT cell activation (Fig. 5⇑B), whereas a defined population of Ag-specific memory CD44high T cells, which can easily be followed in vivo, does proliferate upon NKT cell activation (Fig. 6⇑). Altogether, these data strongly suggest that bystander activation induces proliferation of bona fide memory T cells, defined by a high expression of CD44, but not by a CD62L− CD69+ phenotype associated with recent TCR activation. In conclusion, T cell memory may be maintained by bystander (or Ag-independent) proliferation of CD44high T cells during pathogenesis, and induced by different cytokines, including IFN-αβ, IL-15, IFN-γ, and IL-12. Diverse cells can be activated to produce these cytokines, such as virus-infected cells, neutrophils, monocytes, NK, T, and NKT cells. We propose that bystander proliferation of memory T cells is not controlled by a particular activation pathway, but rather may be induced by an excess of appropriate cytokines produced during infection, tumor rejection, or autoimmunity. An interesting consequence of this hypothesis is that the population of memory T cells is controlled by a self-regulatory mechanism. Indeed, an immune system bearing a low frequency of memory T cells would be more permissive to pathogens, which in turn would induce production of high levels of pro-memory cytokines. On the contrary, a high frequency of memory T cells would better protect against pathogens, and thereby limit the production of pro-memory cytokines. A future aim is to define the limiting factors required for the maintenance of memory T cells. We thank P. Zeach for excellent and extensive FACS sorting, and Drs. 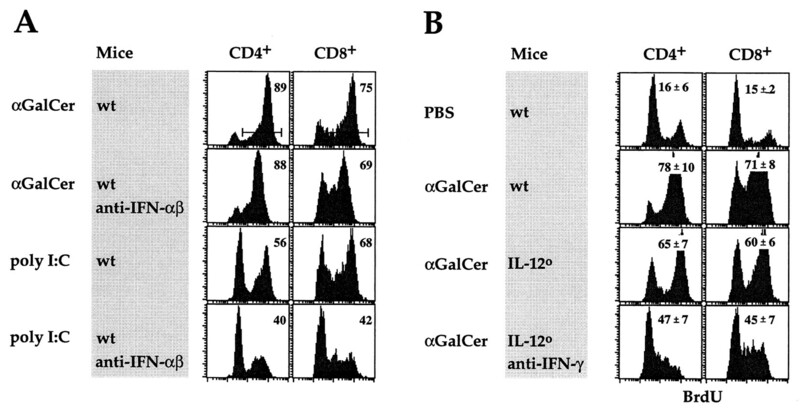 Y. Koezuka, M. J. Grusby, M. Taniguchi, and M. G. Tovey for providing us with α-GalCer, CD1d-deficient mice, Jα281-deficient mice, and sheep antiserum to mouse IFN-αβ. We also thank Dr. P. Romero for helpful discussion. ↵2 Abbreviations used in this paper: α-GalCer, α-galactosylceramide; BrdU, 5-bromo-2′-deoxyuridine; PI, propidium iodide; SEA, staphylococcal enterotoxin A; SEB, staphylococcal enterotoxin B.